“Don’t Dress for Dinner”—a mile-a-minute comedy by Marc Camoletti adapted from the original French by Robin Hawdon—will be the fourth and final play of the Hampton Theatre Company’s 2017-2018 season, opening on May 24 at the Quogue Community Hall and running through June 10. With his wife Jacqueline scheduled to visit her mother, British ex-pat Bernard has invited his chic mistress, Suzanne, to spend the weekend at his converted farmhouse outside Paris. He has arranged for a Cordon Bleu chef to cook for them and has also invited his best friend, Robert, as a suitable alibi. What could possibly go wrong? For starters, unknown to Bernard, Robert and Jacqueline are secret lovers and are determined that Jacqueline will not leave for the weekend; the cook has to pretend she is Bernard’s mistress; and his actual mistress, relegated to the kitchen, is unable to cook. Preposterous alibis and explanations start to pile up … and then the chef’s homicidal husband comes calling. In an evening of hilarious confusion, Bernard, Jacqueline and Robert and are all forced to improvise at breakneck speed. Marc Camoletti’s original version of the play was a hit when it first opened in Paris, running for two years. The Robin Hawdon adaptation ran for six years and more than 2,000 performances in London in the 1990s. “Don’t Dress for Dinner” was called “two of the most rib-tickling hilarious hours I have spent in the theatre in some time” in a review in Chicago Style Magazine. Other rave reviews for the boulevard comedy include: “Pile on the comic chaos!” (Variety); “Gut-busting! Hilarious!” (Entertainment Weekly); and “A near faultless piece of theatrical invention” (The Guardian). French playwright Marc Camoletti (1923 – 2003) was perhaps best known for his signature hit, “Boeing, Boeing,” which ran for seven years in London in an English adaptation by Beverley Cross. The two central characters in “Boeing, Boeing,” Bernard and Robert, turn up again in principal roles in “Don’t Dress for Dinner.” Camoletti’s theatrical career began in 1958, when three of his plays were presented simultaneously in Paris. He was awarded one of France’s highest honors, the Chevalier de la Légion d’honneur, and his plays have been performed in numerous languages in 55 countries. 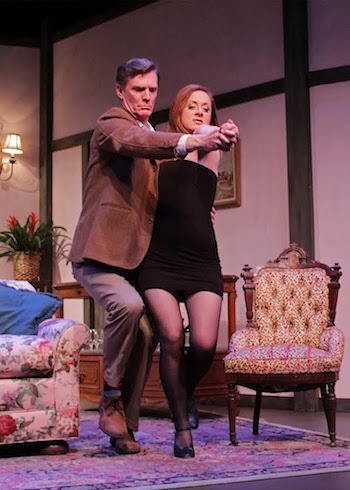 The cast of Hampton Theatre Company’s “Don’t Dress for Dinner” features five HTC veterans and one newcomer to the Quogue stage. Andrew Botsford and Rosemary Cline play Bernard and his wife Jacqueline; Matthew Conlon has the role of Robert; Rebecca Edana is Suzanne; and Amanda Griemsmann plays the chef, Suzette. Making his debut in Quogue is Sam Yarabek, in the role of Suzette’s husband, George. HTC veteran director and actor George A. Loizides directs. Set design is by Sean Marbury; lighting design by Sebastian Paczynski; and costumes by Teresa Lebrun. 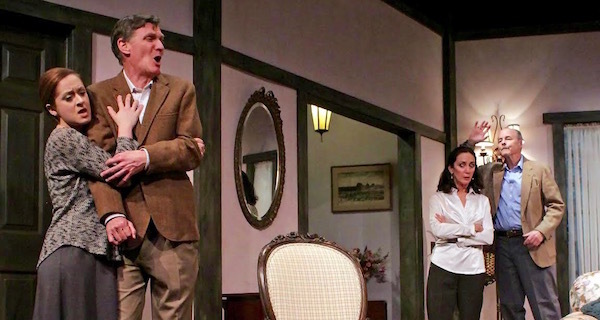 “Don’t Dress for Dinner” runs at the Quogue Community Hall from May 24 to June 10 with shows on Thursdays and Fridays at 7, Saturdays at 8 and Sundays at 2:30. An additional 2:30 p.m. matinee performance will be offered during the final weekend of the production, on Saturday, June 9, prior to the regular 8 p.m. performance that evening. The Hampton Theatre Company will again be offering special dinner and theater packages in collaboration with the Westhampton, Southampton, Hampton Bays and Quogue libraries. Offered in association with the Quogue Club at the Hallock House, a special lunch and theater package is available for the Saturday matinee on June 9. For information about all packages and available discounts, visit www.hamptontheatre.org or email info@hamptontheatre.org. Additional information about library dinner and theater packages is also available through the libraries. To reserve tickets, visit www.hamptontheatre.org, or call OvationTix at 1.866.811.4111. Hampton Theatre Company Will Present "Clybourne Park"